For mountain-biking enthusiasts this is a dream come true! Enjoy the adrenaline rush as you ride along the tarmac roads (the East-West national highway) of Bhutan enjoying the pristine air and aesthetic natural feasts.Considered one of the world’s best cycling holidays, the ride across Bhutan is a challenging experience through some of the highest motorable roads and mountain passes. 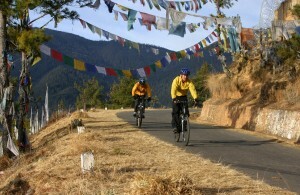 The tour also includes camping along the ‘only’ national highway connecting eastern and western Bhutan and a night halt at one of the villages in Wamrong.